Limits can keep you safe, and they can also hold you back. When you move beyond the limits that are set in day-to-day life, you leave behind the safety of knowing what will happen in the next moment. You also discover things unknown within those limits. Songs can be anticipated, and they can also be predictable. When you play music without the songs, you must rely on your wits and your ears to create the music as you play it. The unexpected becomes the normal as musical moments build to create this spontaneous music. The elements of music are melody, harmony, rhythm and form. When J.D. and the Sons of Rhythm create this music, live in the studio or on stage, they move through the elements of music freely. The skill, sensitivity and experience of each musician combines to create disc ten: Moving Through The Elements. The process of creating this music is both evolutionary and revolutionary. The evolution comes through the experience of ten double CDs of collectively improvised Jazz Fusion. The musicians have learned ways of moving through the elements of these jam sessions, keeping consistency and musicality at the forefront of the music. Playing together produces familiarity and some degree of expectation, as even within collective improvisation, these players have styles. Thus, they build upon ideas recognizable in their essence to the players around them. The evolution is in the various ways the music continues to develop from these ideas. The revolutions happen when various elements are unexpectedly combined, or a new direction seems to come out of nowhere, taking the music and the musicians with it. J.D. has kept the music fresh by putting players into new and different situations, both from what they typically do and from what they normally expect. This began by switching bass players within a group of core players, but has developed to include new players, instruments, and even not knowing who would be present at any given session. Multi-instrumentalist Singer puts it this way: "J.D. has assembled a highly talented, finely tuned group of musicians, any one of whom could be the cornerstone of a band. These players have reflexes - the ability to react to what they hear. We all play our own styles, but being ready for the unexpected is part of the nature of our playing. J.D. 's music allows us to explore this, and bring this active/reactive part of our experience to the forefront." "Yes and no. We are improvisors. That's what we do. Many musicians wouldn't be comfortable with the amount of freedom and lack of structure. These cats just keep playing; making it work. Not everyone has the confidence, faith, experience and chops to keep it together when anything can happen." When you listen to Moving Through the Elements, you will hear this dichotomy of evolution and revolution. All good music, and in fact all good art, has a dynamic of tension and resolution. Part of the tension here is between what usually happens in music and what could happen. The resolution is the music itself - alive and ready to move you through the elements as well. 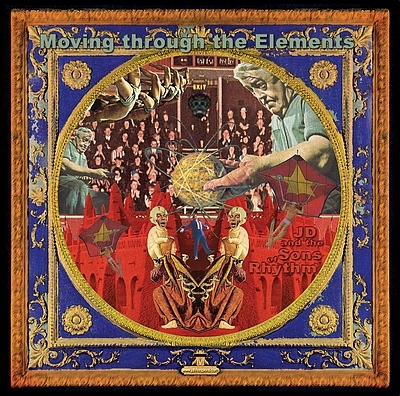 Moving Through The Elements opens with Majic Morning Day, a mellow, World-Beat style groove. Using the Roland GR-30 guitar synthesiser, Frank Singer overdubs multiple tracks on top of J.D. Hopkins and Son Jayson's electronic percussion tracks. The whole gang joins the starting trio for Call of the Night, with Son Rickie on the trap set, Joe Dorris and Tito of Cat's A Bear joining J.D. and Jayson on percussion, Mike Ohm and Sheldon Peterson of Potato Battery on guitars, and Phil Papotnik of Cat's A Bear on saxophone. A funky Latin/World-Beat rhythm sets the tone for a thematic jam - the Call. Kenny Cornelius brings the bass entrance in Ode to Bob Marley, joining the Hopkins family, guitarists Mike and Sheldon, and Singer on guitar and keyboards. A feel best described as Reggae Funk sets the tone for some wailing from Mike, counterpoint from Sheldon, and some chopping from Frank, first on guitar, then on keyboards. A switch of bassists to David Blaetz takes the same ensemble into the spacious Funk feel of Waves. Singer's keyboard and Peterson's guitar set up a dialogue as the rhythm section evolves the groove. Ohm brings in his guitar later in the discussion, mellowing the sound and paving the way for a new feel. The conversation continues three ways into the fade. Space Traffic opens with a multi-tonal jam between Sheldon and Frank with percussion support from the Sons and Joe Dorris. This cadences into a rhythm set up by J.D. on V-Drums, with Phil returning on sax to join Sheldon in the first theme, while Frank responds on guitar. Rickie chimes in with the strings while Jayson and J.D. layer supporting parts. Frank moves over to bass and into some funk while Sheldon keeps the theme moving into a solo. A swing cadence fades out, and into Early Morning Rising, a mellow World-Beat flow with David on bass, Frank on guitar-synth(fl), and Sheldon and Mike on guitars. Disc One ends with a jazz-funk Mindless Over Mater. Dan Schwartz sits in on trap set along with Jayson and J.D. on electronic percussion, Frank on keyboards, and Sheldon and Mike on guitars. The musicians move with this bright, breezy groove until its end, fading as J.D. sets a new rhythm in a jam trimmed from this cut. In 11 and 8, cut one of Disc Two, Rickie, Jayson and J.D. provide rhythm for a series of layered overdubs from Frank, this time on bass, guitar-synthesiser and keyboards. This World-Beat style odd-meter piece fades into Ode to John Coltrane, with Joe Dorris taking the trap-set chair with Jayson and J.D. on electronic percussion, this time joined by fellow Cat's A Bear members Tito on congas, Phil on tenor sax, and Frank on keyboards, and Potato Battery guitarists Sheldon and Mike taking the strings. After a percussion intro, Phil leads the ensemble into a Free Jazz-Funk jam with layers of 7/8 and free-form time. An extended keyboard solo leads into a dialogue between Phil and Sheldon, climaxing in an ascending crescendo. A bubbling free section flows into an eerie ballad, with percussion bringing back Sheldon and Phil for more conversation. Free-form Funk moves the beat back into layered time, with Phil's horn leading the ebb and flow. All three feels merge as this extended live jam breathes into and out of greater levels of intensity. Jayson gets the last word as the fade paves the way for Cruise Control. Kenny Cornelius drives the bass as this Jazz-Funk rhythm fades in on a keyboard solo. Rickie keeps the jazz feel flowing (an ommision on the current CD jacket; Rickie should be listed as drummer on track 10), breaking up the rhythm for the transition to Sheldon and Mike's guitar lines. These dual leads carry the jam through to the fade into Dark Matter Rhumba. J.D. and Jayson handle electronic percussion, joined by Joe on traps and Tito on congas. Phil plays sweeping long-tones (also a CD jacket ommission - track 11), with Frank on keyboards, and Mike and Sheldon on guitar. This World-Funk Latin rhythm is surrounded by hints of Free Jazz, Raga, and Pink Floyd. Dirge and Birth return to the format of the opening track of Disc One, with Jayson and J.D. supporting Frank's guitar-synth overdubs on Dirge, and guitar-synth and guitar on the World-Beat ethnic-sounding Birth. These two short pieces are followed by Jayson and Frank Dialogue. Beginning with a 6/8 melodic drum pattern from J.D. 's V-Drums, Dialogue builds from Jayson and Rickie's rhythmic additions. Kenny returns on bass, playing lines with Mike and Sheldon while Frank keeps a mallet-like sound moving on keyboards. An intense swing layers with the World-Beat groove, moving into hard Funk and back again. Mike flexes his chops as the texture grows more dense, suddenly disolving into Free Jazz-funk ala Miles and Weather Report (with strings). Fading in from the previous fade-out, Intergalactic Drift features the same group, beginning with some guitar lines from Frank, and working into a Jazz-fusion style Ballad. Sheldon lays some melodic material over the development, While Mike's guitar sings in the etheric background. Frank retakes the lead later in the exposition, building lines above the already linear texture. Drift ends with a cadence, paving the way for the final track, Dan's Strut. Drummer Dan Schwartz sets up the groove with J.D. and Jayson, with Frank on keyboards, Mike and Sheldon on guitar, and David Blaetz on bass. David works the developing groove into a medium Funk feel, with Mike stating melodic themes above. Frank takes a stretch on keyboards, with multiple textures weaving in and out through the development of the music. After a transitional section, Sheldon takes over and builds his themes over the evolving groove. A long cadence brings the music to a close with a fade sounding the beginning of another groove. Sixteen tracks on two CDs carry you through musical variations with a variety of players, all working together to create spontaneous music. Moving Through the Elements will move you - elementally. MOVING THROUGH THE ELEMENTS, 16 tracks of music on 2 discs.